We should give away the extra food to the homeless in our area. People can do that as a family, as a school, or as a store or restaurant. Find volunteers to deliver food items to food pantries. Educate people to purchase less. Great sentiment, but also a horribly oversimplified analysis that actually detracts from finding a true solution. 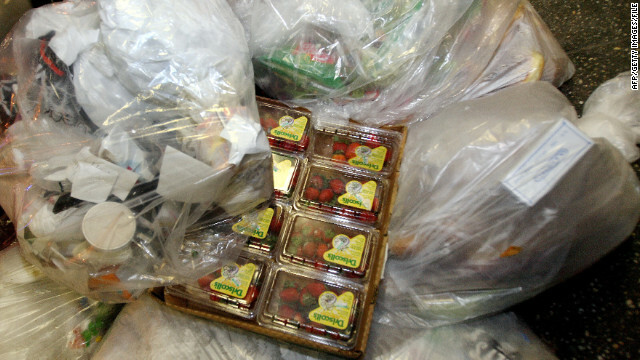 Restaurants/Supermarkets/Schools do not throw away perfectly good food. They wait until it is no longer fresh enough to be served and then they dispose of it. Food Network had a great show on this a short while back called the "Great Waste". II used to work in the Restaurant Industry and I witnessed first hand the horrible waste. Big portions that generated lots of leftovers, Buffet lines with trays of food going to the trash at the end of the day. It was sickening. Waste is inevitable, but why not minimize it? I think business owners and managers should revisit the Waste management training course and we, as consumers should "chew as much we can swallow". We do waste food. We try to cook only enough for a meal because we don't like left overs. I know many think we should use all the surplus to feed the poor and the world. Our poor fine. The world, only when they quit breeding like rabbits and learn to help themselves. We as a country buy a great deal of food from other countries. Let's cut down and listen to them cry about restraint of trade and how times are tough for them. We produce it, we have the say in how it's used. It's up to each individual to make smarter choices. And talk about waste– Been on a cruise ship lately? I thought it was Especially sad a few years ago when the Major Food chains started DESTROYING the Thrown Out food so the POOR would not be seen Rummaging through the TRASH for FOOD. Wrong. Value is exactly what it is, at the time of the transaction. Value is an agreement beteween parties. This article is biased, and is using guilt to influence behvior in order to support an agenda. Wrong, wrong, wrong. Go to Canada. Or the Northeastern US. If you truly believe that the ONLY Value anything has is the amount of MONEY you can make from a Transaction – Then THAT is why Our SPECIES will Cease to EXIST on this Planet. If prices were to go up, America would not be so inclined to buy more than they can eat. It is in there culture to buy more than they can consume. Cheap food is why people are so obese and why there is so much waste. Time to hike up the prices. The price would go up if the government didn't subsidize it so heavily. Exactly,even I consider myself is a frugal person,I buy food more than I need. The food stores(dry food)in my house can feed me 3 months. I just can't resist not to buy because food is on sale all the time, but I also save some for donations. If approximatly 40 million people are on some state/federal assistance hiking up food prices will only put more load on taxpayers. Is this your goal? I think the article indicates a large part of the waste is before it even makes it to your home. I remember when we were suppose to send this all to the starving Chinese. let someone go hungry for awhile, and they'll learn not to waste food. People have to be taught to respect food.They sure will, with an empty belly. With our Bread Basket in drought, we'll see a few million americans wake up. There are two key ways I can think of to end or curb waste at the supermarket level – end oppressive health code restrictions on what can be done with food that's past a "sell by" date, and implement a system where the sell-by date is electronically linked to the item's price (maybe thru the barcode, though it would be tricky). How many people are currently going hungry who could benefit if, instead of going into the dumpster at the end of the day, the supermarket's leftover rotisserie chickens were thrown into a freezer and then handed off to a charity? Regulations could be finnessed such that stores would not be under threat of legal liability in these cases, and could optionally reap tax benefits for donated goods which would otherwise have just gone to waste. Why not? And if items started being electronically linked to their expiration dates, stores could figure out a pricing structure whereby items drop in price exponentially in their last days on the shelf – and consumers who are bargain-conscious and realize that an item at its "sell-by" date is not actually bad at all, will actually hunt down any such items and therefore keep stores from needing to waste nearly as much. And people who want the *newest possible* jug of milk will be able to pay a very small premium for it. Win-win, no? And there came to pass a time where there was no food. Nothing of fur or feather of scale or shell for it had all be eradicated by new developments. Nor the land or the sea held any living creature for contamination had poisoned all that lived. All that had been green plantlife was cleared away leaving new houses in their wake so there was no grazing place, or forest or jungle and all the animals perished. Insects also had been sprayed into oblivion so even the plentiful roach became extinct. Flies had no carrion or rot and thusly all died. dogs and cats, killed by the millions were only a memory and furred and feathered creatures crushed by highway tires nourised the pavement only. for want of protein humans turned to the only plentiful thing that was abundant for nourishment: themselves. While food waste is on every level and hardly can be controlled on haushold level, the tossing out good quality food by big retailers to keep prices high is really a problem, which should be addressed. it has nothing to do with "keeping prices high" – it has everything to do with liability and expiration dates. the retailers are not the ones who set the expiration dates, nor the rules as to what can be done with food that's out-of-date. The claim that "Food represents a small portion of many Americans' budgets" has become less true than ever, still this is an appalling situation. If anything this article is an understatement. Eating out at restaurants that serve heaping plateloads of food has become a kind of sport. Ours is a nation of waste. We should be concerned for how we are creating a system of 'feast or famine,' all or nothing, a zero sum game where the small sustainable farmer is pushed out of the market. I agree with Gina b - if people knew what it's like to go hungry for extended periods they would see things far differently. I do, having lived through a youth of relying only on school lunches, coming home to a house with absolutely nothing to eat and waiting all night for our dad to show up with p-nut butter & jelly & a loaf of bread. While I am a tremendous supporter of farmers I nonetheless feel it's time to reduce subsidies or at least do some serious restructuring, especially with corn subsidies which largely support the big business. Clearly, we do not need to be mass producing by genetic alteration and importing the amount of food that we do in this country. We are major polluters.We need to stop buying so much. We need to respect the aina, this beautiful living planet we share life with. We need to look at what we are doing and teaching and do it differently. We need to wake up. Not only are Americans incredibly overweight and unhealthy, but they also are porcine-like wasters of vital resources, including food, water, and energy. A doomed empire slouches towards its just rewards, spewing wobegone tales of 'American exceptionalism' that have been turned on their collective critically unthinking heads. Greed doesn't clarify............greed KILLS.